So we actually got some snow then! We did not have a single day of snow last year and the summer was awful. I think, and hope, there's some truth in it when they say if it's a hard winter you get a great summer. It's usually like that. I'm normally a massive snow lover. I saw the big chunks fall down from the sky last night and it looked so peaceful, but that was before I had to do my first school run in it! 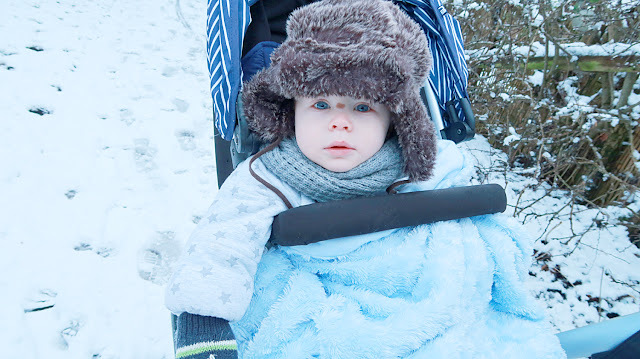 And I had to come to the realisation that my Mothercare Xpedior pram does not function in snow. I thought the big back wheels would have been an asset but it turns out they're actually way too flat they turn into squares when piled high with sludge and it was like pushing something that lacked wheels altogether. I've not had such a great (great...) work out in a long time. I rather it not have been at 8.30 in the morning when I'm 16 weeks pregnant! That's all.